Across the centuries the Knights of the Garter have included in their number many intriguing characters and historically influential figures; however, Haile Selassie I, who was crowned Emperor of Ethiopia in 1930 at the Cathedral of St George in Addis Ababa, is perhaps the only Knight of the Garter to have become the central focus for a new religious movement, being worshipped as God incarnate by the Rastafari movement. 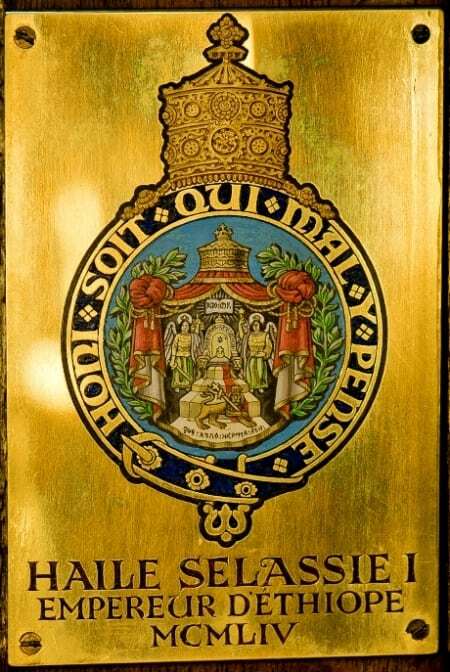 This image shows the stall plate of Haile Selassie I, who was made a Knight of the Garter in 1954. It features the red, gold and green of the Ethiopian flag with the Conquering Lion of the Tribe of Judah in the foreground. Two angels support the throne of Solomon; these represent Haile Selassie’s alleged lineage from Menelik I, the son of King Solomon (whose father King David is an important figure in Jewish, Islamic and Christian religious traditions) and the Queen of Sheba. Selassie led Ethiopia to join the League of Nations in 1923 and remained a vocal advocate of collective security throughout his life. He became an icon for anti-fascists in the 1930s following his address to the League of Nations over the Italian invasion of Ethiopia. This address led to Selassie being named Time Magazine’s ‘Man of the Year’, but he was unable to prompt collective action so moved his family to safety at Fairfield House in Bath. While resident in England Selassie spent much of his time reading, writing and campaigning for intervention against Italy; he eventually returned to his country in 1941 and in 1945 Ethiopia became a charter member of the United Nations. In the 1960s Selassie faced domestic problems with student and peasant unrest. Further political instability in the 1970s was exacerbated during the 1972-1974 Ethiopian famine. Following a military coup in 1974 Selassie was deposed and spent the last months of his life under house arrest before his death in 1975. Despite the unhappy end to Haile Selassie’s life, his support of Pan Africanism and European decolonisation, in combination with his Biblical lineage, led to the development of the Rastafari religious movement from the 1930s onwards. Selassie did not participate directly in the Rastafari religious movement himself, but the movement’s name was taken from his pre-imperial title Ras Tafari Makonnen, and embraced Selassie as a messianic figure. The Rastafari way of life is today popularly associated with reggae music and dreadlocks (worn in response to passages in the books of Leviticus and Numbers and as a symbol of ethnic identity); other spiritual practices include holy days (groundations), Rastafari vocabulary, vegetarianism and abstinence from alcohol. The stall plate of Haile Selassie is not only a permanent memorial to his time as a Knight of the Garter, but is also symbolic of the complex man who defined a nation for much of the twentieth century and who remains at the centre of the Rastafari cultural and religious movement.